The Ecology Center’s Youth Environmental Academy (YEA) is a green leadership development program for young people ages 15-24. YEA provides structured, paid internships to youth at our offices in West Berkeley. Through programming based on the nationally acclaimed Roots of Success curriculum, youth emerge with content knowledge across the following areas: 1) Health, Food Systems, Food Justice, and Sustainable Agriculture, 2) Alternative Energy, 3) Climate Change, 4) Water Conservation, and 5) Waste Management and Recycling. YEA participants “earn and learn” with opportunities to move to positions of greater responsibility and leadership – from Youth Scholars to Youth Interns to Youth Program Assistants. 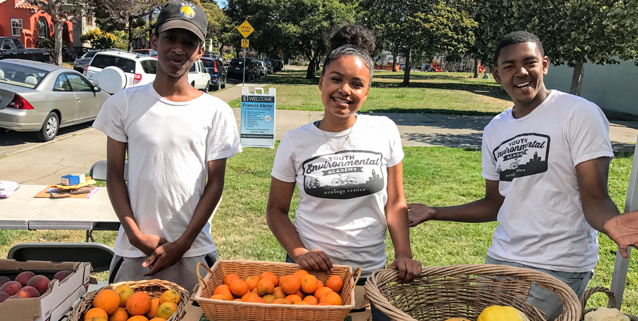 Ecology Center’s Youth Development program inspires, engages and prepares youth ages 15–24 to become the next generation of environmental justice advocates. The program builds on youths’ strengths to provide environmental education and work experience. 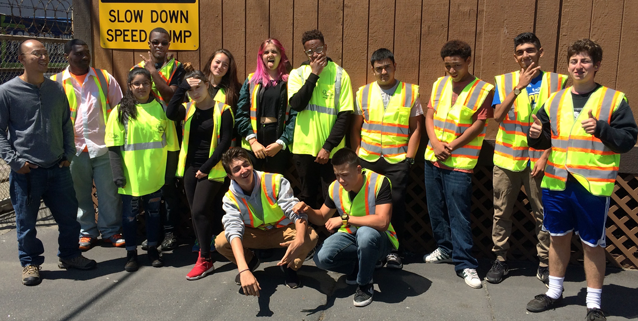 We aim to prepare youth for careers across many sectors that improve environmental conditions and well-being of East Bay communities and beyond. We prioritize engaging youth from low-income communities of color, as we aim to support and develop more youth environmental advocates of color in our community. 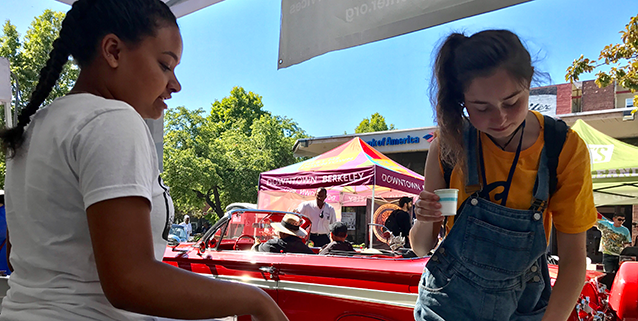 Outreach and education at Berkeley High School and other community events for our healthy beverage campaign, For Thirst Water First. Door-to-door outreach and education at multi-unit apartment buildings in Berkeley to promote Zero Waste and improve recycling and composting. 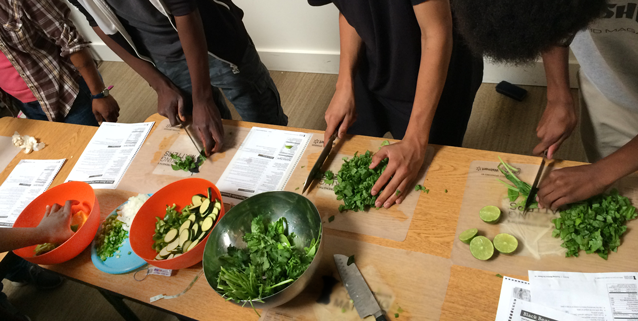 A youth cohort attended and shared local work at a national, youth food justice gathering, Rooted In Community. Staffed a range of Ecology Center programs – farmers’ market, Store, recycling office, and educational events – supporting free and low-cost community services. Be more prepared for the workforce and develop positive professional practices, increased employable skills, and plan for continued education. Express increased confidence and healthy self-esteem, while upholding the dignity and value of others. Develop healthy and environmentally conscious behaviors and practices, and in turn work to influence the wellbeing of their families, peers, and communities. Analyze the harmful impact of bias and injustice on the world. Recognize that power and privilege influence relationships and analyze how their communities have been affected by those dynamics. Be able to speak and act with skill, courage and respect on behalf of the well-being of themselves and others, through a variety of community outreach and peer education projects, events and initiatives. YEA Youth Scholars are recruited via the City of Berkeley’s Youthworks program and Berkeley Youth Alternatives. The Youth Environmental Academy offers an 8-week session during the summer and a 15-week afterschool session in the spring. Check back for 2018 session dates to be posted here. Healthy Berkeley Program (part of the City’s Public Health Division, funded by the soda tax) – supporting community- and school-based strategies for reducing the consumption of sugar-sweetened beverages and raising awareness about the harmful health impacts of sugar-sweetened beverages in children, youth, and adults in Berkeley. The Dean Witter Foundation – supporting organizations that offer professional development opportunities for youth, and inspire youth to improve the stewardship of natural resources, get outdoors, and connect with the environment. 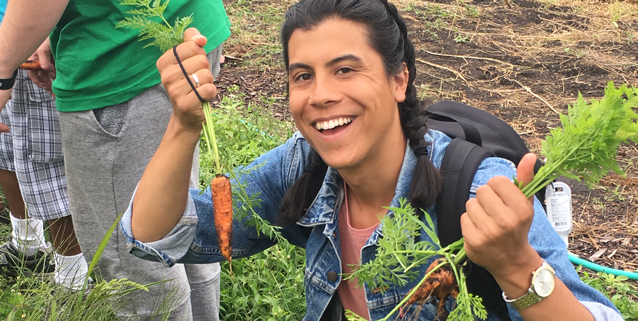 Annie’s Homegrown “Hometown Grant” – supporting YEA’s nutrition education and food justice efforts in alignment with their mission to improve health and wellness among all families, and the planet. Supporting the Youth Environmental Academy will help teens and young adults grow into outstanding environmental advocates. All of our program support comes from grants and individual donations. We welcome contributions of any amount. If you’re interested, please email us at: give@ecologycenter.org. Our youth scholars need tools to succeed as environmental advocates. If your company is interested in contributing new products such as personal computers, phones, cameras, or video cameras, please contact us by email at: give@ecologycenter.org.